The audience at Quay Arts on Wednesday last week enjoyed an unforgettable evening’s entertainment by RedTIE Theatre. Not only was the play, The Filibuster, a spell-binding drama, but the cast of three included a brilliant understudy who had stepped in just a few days earlier. 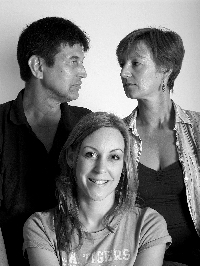 The Filibuster, by Island playwright Hazel Wyld, features a middle-aged couple at a crossroads in their marriage after their 30-year-old Downs Syndrome daughter has gone to live in a home. Hazel Wyld has raised a child with learning difficulties, which perhaps explains why the play was exceptionally poignant. The friend who accompanied me works with people with special needs. She confirmed that the issues raised — guilt over placing an adult child in a home, loneliness after they have left and anxiety about the parent dying before the child, to name a few — were totally true to life. Personal experience might also have enhanced the stunning performance by Helen Reading, who played the wife, Sybil. Helen has a brother, Darren, who has Downs Syndrome and works at Haylands Farm. The production raised money for Haylands Farm. Sybil’s husband, John, was played by Steve Reading, Helen’s husband. The part was to have been played by Kevin Mitchell, who is battling cancer and was in hospital. John English, Kevin’s partner, and Steve were directors of the production and when they heard Kevin could not be there, Steve stepped into the breach. His performance was remarkably fluent: although he used a script, after the first few minutes, it was barely noticeable. The play was mainly dialogue, punctuated by monologues, so Steve’s performance was no mean feat. There was plenty of passion in the plot. When one of John’s former lovers, the glamorous Belinda, played by Rebecca Brough, visited, we learned he had had a series of affairs throughout their marriage. Sybil was overwhelmed by feelings of loss over her daughter’s leaving and resentment towards John. The big question is: Will their marriage survive? I shall not give away the answer, because if Red Tie Theatre stage The Filibuster again (they put it on once before, in September 2008, also at Quay Arts), I would urge you to see it.